Think you have it rough? You might! But gamers in China have it rough. Consoles, while widely sold, are illegal. This means that gamers do not have official support. 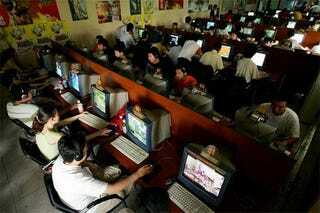 The government continues to crackdown on online games. According to China blog ChinaGeeks, perceptions of Chinese gamers has lead to stereotypes and prejudices in Taiwan, where many of the servers are located. "I was cursed at by Taiwanese players for no reason at all! How many others have had similar experiences? For example, being called 'Mainland dog' or 'communist [agongzi]1'? And I used to really like Taiwanese people..."
"This happens quite often. Just ignore them, there's no point in arguing with the brain-damaged. I've heard things like 'Mainland dog' hundreds of times." "There are extremists everywhere; just ignore them, there's no need to implicate everyone from the same place as the extremist." "As soon as someone Taiwanese spots a simplified character, they just yell ‘Mainland dog' over and over." "Yes, but in someone else's territory you must swallow your anger, it's all because we don't have our own battle.net"
"Starcraft 2 is out. When will Netease release the official version? They won't make us wait too long, right? Anyway, battle.net already requires a monthly fee, so how could they see such a big cake and not feel hungry?" "Don't bother waiting. Even if you manage to wait for it, it will just be river-crabbed [censored]." "[The official Chinese version] will be out when Starcraft 3 is released." "In addition to waiting, we will also have to wait some more. We gamers really suffer."